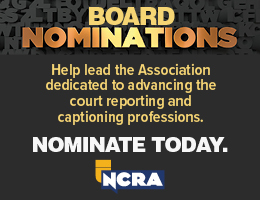 Don’t miss your chance to nominate someone or yourself to serve on NCRA’s Board of Directors. Serving on the Board is a great way to give back to the profession from which you have gained so much and help steer the Association into the future. Hurry, the deadline to declare your candidacy or submit a recommendation to boardnominations@ncra.org is Jan. 18. The Board of Directors represents the wide diversity of the NCRA membership through its nomination and election of Officers and Directors. 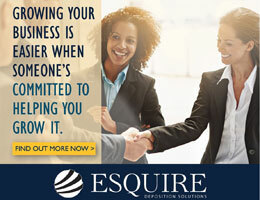 This diversity of perspective, background, and thought includes both the variety of professions members engage in – captioner, educator, firm owner, freelancer, and official – and the cultural, socioeconomic, race, gender, and other differences that give us our unique perspectives. The Nominating Committee will consider nominations that reflect this broad spectrum of experience. Candidates should exemplify the qualities of leadership in the court reporting and captioning professions. 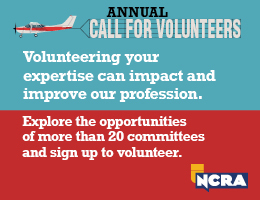 In your recommendation, please include why you think the candidate should serve on the NCRA Board. Do not hesitate to nominate yourself. 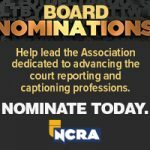 NCRA is the premier organization representing the court reporting and captioning professions. Its Directors and Officers work together to steer the organization toward a sustainable future by adopting sound, ethical, and legal governance and financial management policies, as well as providing strategic guidance to ensure NCRA provides the necessary resources for success. Remember, declare your candidacy or submit recommendations to boardnominations@ncra.org by Jan. 18, 2019. As a courtesy, please contact your candidate directly prior to submitting his or her name.